I’ve enjoyed eating churros ever since I was a child—they’re delightfully sweet and doughy, perfect for carboholics like myself! If you haven’t tried them before, churros are essentially fried dough coated with cinnamon sugar; basically the Spanish and Latin American version of the donut. Delicious! It’s been a while since I’ve shared a dessert recipe, and with Cinco De Mayo coming up fast (tomorrow!) I immediately thought of churros. Being raised in California, I remember school-hosted Cinco de Mayo celebrations where we’d enjoy a plethora of Mexican delicacies including this cinnamon sugar dessert! While traditionally deep fried, I wanted to try my hand at a less-guilty baked version. And so my weekend baking project commenced; perfect timing, too, since I needed to think of what to bring for a Central Park picnic I was going to attend! Picnic foods can be pretty tricky—salads, pastas, and pies require too much utensilware and certain foods (like chocolate) have a tendency to turn into a melted mess very quickly. 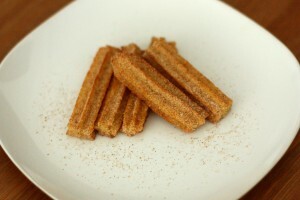 But churros don’t require any utensils and are safe from risk of melting! Despite all that, the churros were a hit! All of my taste testers at the picnic agreed that this was a winning recipe. No one could tell it was baked as opposed to fried, and the bite sized portions made them easy to transport. A healthier, baked version the popular fried dough dessert from Spain and much of Latin America; cruncy on the outside, soft and doughy on the inside, coated with a layer of cinnamon sugar. Add water, salt, brown sugar, and butter to a medium saucepan and bring to a boil. While waiting to boil, beat eggs and vanilla together in a separate bowl and set aside. Take off heat when water-butter mixture has boiled, and add in flour(s) and stir until well combined. Add egg mixture to saucepan and combine well (I used the help of an electric hand mixture). Line baking sheets and preheat oven to 400°F; prepare a piping bag with a large star piping tip (I used Wilton #1M). 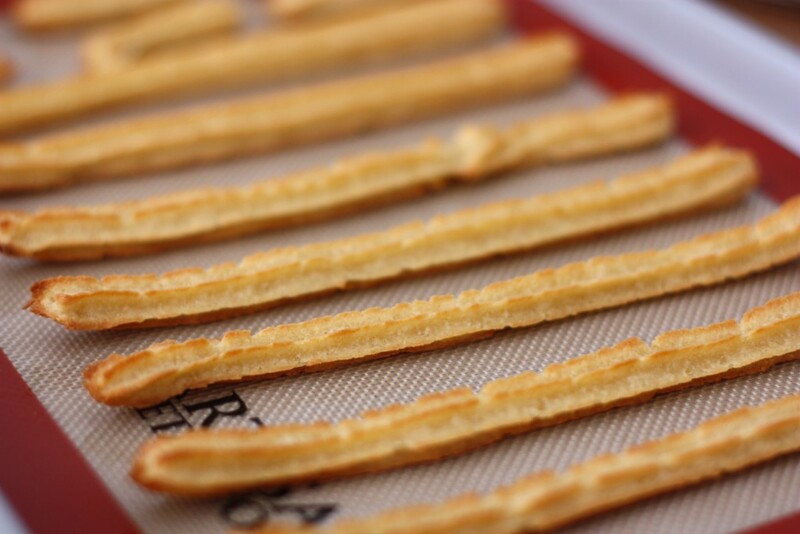 Scoop prepared dough into pastry piping bag; pipe dough out onto baking sheets into long strips, leaving 1-2 inches of room between each piped churro strip. Bake for ~ 12-15 minutes until ends start to just turn brown, then change to hi-broil setting for the last 5 minutes to give the churros their iconic golden-brown color. Remove from heat and let cool for a few minutes before rolling. In a small bowl, mix together granulated sugar with cinnamon. Transfer cinnamon sugar to an appropriately sized bowl or container and roll churros to coat. I chose to cut churro strips into thirds (~4 inches) to make more snack-friendly sizes, in addition to it being easier to roll and transport. Other dipping/filling ideas include berry jams, melted chocolate, hot chocolate, nutella, custards and puddings. 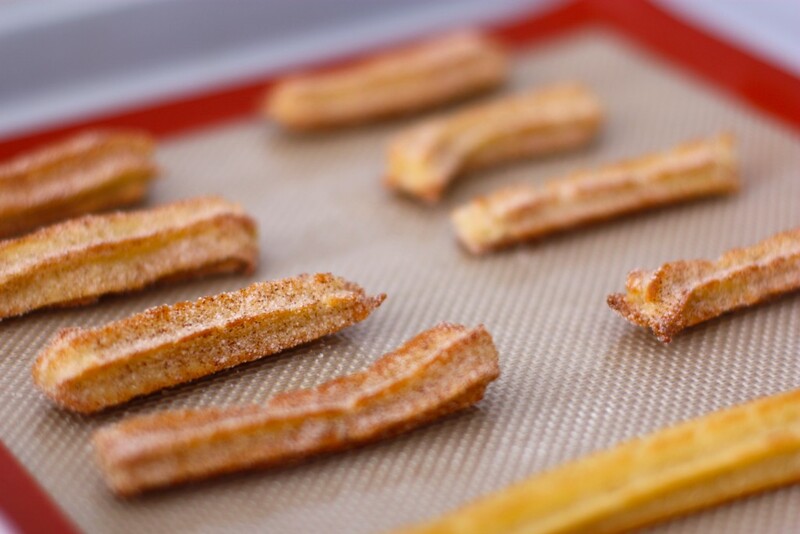 Leftover churros can be reheated in an oven, and re-rolled in cinnamon sugar to taste as good as it did fresh out of the oven! Wishing everyone a Feliz Cinco de Mayo and a great start to the picnicing season… Hooray for warmer weather! As always, thanks for dropping by and please leave your thoughts and comments below!